Texas Governor Greg Abbott engages with PESA Fly-In attendees at the Capitol. Representatives from PESA member companies – Baker Hughes, Cameron, a Schlumberger Company, Caterpillar Oil & Gas, Cummins, DistributionNOW, FairfieldNodal, Forged Products, Halliburton, Hoover Ferguson, Industrial Tax Consulting, Li Gear, M&M International, Premier Pipe, Schlumberger, SOR, Inc., Stallion Oilfield Services, TechnipFMC, and Weir Oil and Gas – met with Congressional members and staff during the PESA Washington, D.C. Fly-In held February 26-28, 2017. As the new Administration and Congress begin to move forward with their agenda, the oil and natural gas industry is experiencing a sense of optimism. The Fly-In provided an opportunity for PESA and attending member companies to convey the importance of implementing policies that ensure a secure supply of abundant, affordable, and reliable energy for the American people in an environmentally responsible manner. Attendees developed and strengthened relationships with more than 20 Congressional offices including Senator Ted Cruz (R-TX), Senator Sherrod Brown (D-OH), House Majority Whip Steve Scalise (R-LA), and other members of the U.S Congress, as well as House and Senate staffers. Fly-In participants emphasized the important role that oil and natural gas plays in modern life, while also highlighting the service and supply sector’s commitment to innovation, safety, and job creation in our diverse manufacturing and engineering workforce. Meetings were also held with lawmakers representing areas outside the oil patch, enforcing our message of the entire energy value chain. The 26 Fly-In attendees divided into five groups to meet with Congressional offices. Small group structure provided each attendee the opportunity to discuss detailed contributions to job creation and innovation as well as potential negative impacts and unintended consequences that regulations may have on his or her own business. In between Congressional meetings, Fly-In attendees had lunch with David Bernhardt of Browstein Hyatt Faber Schreck. Mr. Bernhardt serves as an advisor to the Trump Transition for issues associated with the Department of the Interior (DOI). Mr. Bernhardt shared his insights on the process to bringing in a new leadership team at DOI and other departments and agencies. The Fly-In program also included presentations and discussions with representatives from a policy institution and DC-based leadership of multiple E&P companies. These discussions began on Monday morning with a presentation by Adam Sieminski from the Center for Strategic and International Studies. Mr. Sieminski discussed the current geopolitical energy landscape and the implications for the industry in the future. Following Mr. Sieminski’s presentation, attendees heard from an operator panel of DC-based representatives including Mary Streett, VP Communications and External Affairs, BP; Bill Koetzle, Manager Federal Government Affairs, Chevron; and John Dabbar, VP Federal and State Government Affairs, ConocoPhillips. Specific regulations and legislation of importance, as well as the overall policy and political landscape in Washington regarding the oil and natural gas industry were topics during the discussion. 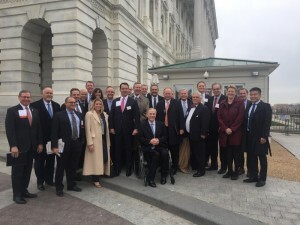 On Monday afternoon, all attendees met with top energy policy staffers from the offices of Senate Majority Leader Mitch McConnell (R-KY) and House Speaker Paul Ryan (R- WI). In these meetings, staffers shared their views on the near-term outlook for key legislative initiatives including the overhaul of Affordable Care Act and tax reform. While at the Capitol, PESA attendees crossed paths with Texas Governor Greg Abbott who was in town for the National Governors Association meeting. Governor Abbott was pleased to learn PESA was engaging with members of the U.S. Congress on the importance of the oil and natural gas industry and the commitment of the service and supply sector to innovation, safety and job creation. Monday closed with a reception and dinner in the Capitol Building, where Congressional offices, State officials and industry representatives networked and discussed policy priorities for 2017 and beyond. While the outlook for the energy industry is positive, there is still plenty of uncertainty on many policy issue as well as continued challenges from the anti-fossil fuel movement. It is paramount that PESA and member companies continue to educate policymakers about the sector, our shared commitment to innovation, safety and job creation, and the importance of oil and natural gas to society. The next opportunity for PESA and member companies to engage lawmakers will be at Texas Energy Day. The event will be held in Austin on March 22, 2017. Member companies already planning to participate include Forged Products, Stallion Oilfield Services, and Cameron, a Schlumberger Company. If you have any questions or would like to discuss the Fly-In or Texas Energy Day, please contact Jean Gould at jgould@pesa.org or 713-933-1920.